They've outdone themselves this time. Here at MTL Blog, we've reported on the misadventures of Montreal's construction squad countless times. It seems to be a trend that at least once a month, we'll find a photo or a report of how Montreal's construction workers have made an apparent mistake or engaged in some pretty risky antics. Recall, for example, when workers used a bulldozer hanging from a crane to demolish a façade downtown. This time around, they've managed to out-do themselves by trying to fight mother nature with their favourite weapon: asphalt. Remember that one time they paved around a parked car? That instant classic went viral for all the wrong reasons. TL;DR Montreal construction workers pave into an ice hole to "repair" it, prompting huge WTF responses from social media. How about that time they completely damaged a Plateau side street by paving literal leaves into the asphalt? This was especially hilarious because their laziness not only screwed up the road, but also the surrounding sidewalks. Today, we discovered another hall-of-famer. Montreal construction workers in Hochelaga-Maisonneuve decided it would be a great idea to pave asphalt into some holes in the road. Though this wasn't your typical botched pothole job. No, no, this time, Montreal workers paved literal ice. Yes. They put asphalt to patch the holes in the ice. Are they aware that ice melts? Like, look at this. Look! This image was posted to Reddit here! According to one Reddit comment by user donniedumphy, this is a deliberately temporary fix: "that stuff is called cold patch, it comes in a bag. It’s temp stuff and will break up in short order. Ain’t no asphalt available till the spring when the plant opens again." But this temporary application is likely equally concerning to Montrealers. 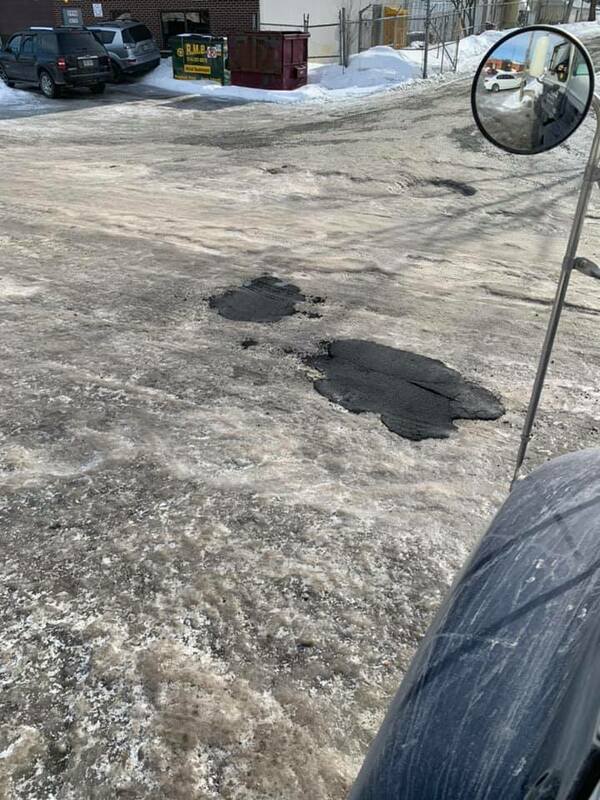 The asphalt is likely to deteriorate as the ice melts, leaving mounds of rock in the middle of the road. Apparently, the next big street problem will be the reverse pothole. You thought dodging crater-like holes in the road was fun? Just wait 'til you see the reverse pothole! It's all the fun of a speed-bump with zero functionality! This technique could be a great idea for the future of Montreal de-icing efforts. Instead of salting the roads and removing the ice, the city should just pave over it. And boom, once the ice melts, we have a whole new street! Two birds, one stone. I should run for mayor. All joking aside, we hope that a permanent fix is on the horizon.